Instead of being the good guy in this game, you are directing the actions of a thief inside a vault containing gold bars and treasures. We are not told to whom this wealth belongs; I prefer not to think of the poor soul who has worked hard all of his life so that he can take it easy in retirement and provide for his ailing child . . .
At any rate, sentimentality will get you nowhere in this game. You are to steal all the bars in each vault and as many treasures as you can. The treasures show up for a few seconds and then disappear; you must be very quick to score on these but they are worth big points if you succeed. Also in the vault with the thief and the gold are four policemen. Obviously, they try to capture the thief and foil his plan, but at first are not tremendously effective. Sometimes they doggedly track the thief, but just as often they turn around and go in the wrong direction. Usually your thief will be able to pick up quite a few bars before making a fatal mistake. The trick is to stay out of the corners as much as possible, for two reasons. First, it is a good place to get trapped, and also it is the farthest point from the spot at which the treasures make their appearance (the center of the board). It is difficult to make the trip all the way from a distant corner to the center of the board before the treasure disappears, and in your haste a cop may waste you! To make the thief's task a little easier, there are two open doors on each side of the vault. He can exit through one of these, reappearing on the other side of the screen. This is a useful evasion tactic, assuming that there are no cops waiting on the other side. There are also temporary doors which the thief can throw up (you press the red fire button on the joystick) as he makes his way around the vault. These remain shut only a few seconds stopping not only the cops, but also the thief, and therefore must be used with caution. More than one of my thieves has locked himself into a corner with a policeman--they show no mercy. If you can manage to trap a policeman between two temporary doors you will be awarded 2000 extra points as well the privilege of putting him out of action for a little while. Fortunately, this is not a one-man job; there are four extra thieves waiting in the wings, in case the first gets captured. Each time a thief is captured the action stops and you must restart the game by pressing the red button. The action also stops each time you clear a board of gold bars. As the game gets more intense, you will be grateful for the chance to breathe. Aside from the obvious score-building, your main objective here is to remain alert for an escape route. Unless the cops are busy elsewhere, your man must be prepared for their sudden appearance in front of him. However, they are not athletes, and you should have little trouble outrunning them. Game 2 is the two-player version of Lock 'N' Chase. I like this one! It is similar to, but much better than, Atari's Pac-Man. Also, it is possible to improve your score significantly with practice. doubling for each one thereafter. doubling on each screen thereafter. Jawbreaker is a hypoglycemic's' fantasy. You (actually your teeth) are trapped in a candy factory, and your objective is to eat all the candy bars while avoiding collisions with the smiling faces (dental assistants?) gliding back and forth through the rows. The smiling faces can approach you from either side of the screen, and will change directions to chase you, especially if you get too close. The joystick moves the teeth horizontally or vertically, with the red button acting as a brake to stop their movement. When the button is released, the teeth will resume movement in the direction they were headed. Up to three times during each frame a vitamin pill will appear in the center of the maze. It will remain there until you eat it, at which time you will have a brief spurt of energy to turn on the smiling faces and eat them for bonus points. As the energy starts to run out, the faces will flash red and white a couple of times. It is risky to go after them at this point, since they may turn malicious at the precise moment you touch them. There are 135 candy bars in the maze; when they are all consumed, a toothbrush comes out to clean your teeth, you are awarded bonus points, and a new frame appears. After every even-numbered frame you earn a new set of dentures, with a maximum of three at any one time. The number of sets of teeth remaining is displayed in the top left corner of the screen. Since the extreme top and bottom row have only one escape door each, they are somewhat harder to clear of candy bars without meeting up with the smiling faces. Therefore, it can be to your advantage to do these when the faces are edible, especially as the speed of the game progresses. It is also to your advantage to delay the clearing of the board until all three vitamin pills have appeared and been eaten. Since eating smiles is worth big points, don't hurry on to the next, faster, frame before getting as many of those insipid faces as possible. Jawbreaker is another in the apparently unending series of maze games. It is amusing, but you only need so many of this variety of game, and this one can be mastered without a terrific amount of skill. It is one of the better games for small children. Game 1: One player. Faces move at fast speed. Game 2: Two players. Faces move at medium speed. Game 3: One player. Faces move at medium speed. Game 4: Two players. Faces move at medium speed. Game 5: One player. Faces move at slow speed. Game 6: Two Players. Faces move at slow speed. Contrary to video game custom, Game 1 is the hardest. On your first attempt, remember to switch to an easier level so you won't feel so inept. Despite the fact that the front panel on the package leads you to believe that this is a super futuristic space game, it is in reality a rather silly game about the rock band, Journey. Before the game begins you are treated to a computerized rendition of Journey's song, "Don't Stop Believing." Believe me, it loses a lot in the translation. After the musical introduction (press the red button to begin play) your objective is to guide the various members of the band (listed by name in the instruction booklet) individually through a crowd of Love-Crazed Groupies, Shifty-Eyed Promoters, Sneaky Photographers, and Stage Barriers. All of these distractions will cost the band member time, money, or both. In among these bad guys are also Loyal Roadies and Mighty Managers, who make your travel easier. In addition, the Mighty Manager adds $9900 to your score when you are able to reach him in the crowd. Behind the obstacles is a "kaleidoscope of strobing stage lights" which look remarkably like colored snow. I found these very confusing. 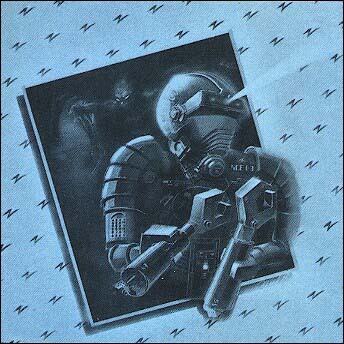 The band members are not aimlessly wandering through this hostile crowd, but are headed for their Scarab Escape Vehicle, and must reach it before their time runs out. The game ends when any one of the members fails to make the trip in the allotted time. When a band member is guided (via your joystick) to the upper portion of the screen, he runs faster. However, this causes the crowd to move by him more quickly and results in his being hit more frequently by them. To speed up any of his maneuvers, press the red button while moving the man. This does not make a terrific difference, but helps slightly. After you have successfully helped the five members to the Scarab Escape Vehicle and on to their next concert, you are awarded a bonus $50,000 and a chance to do the whole thing again on a more difficult level. This continues until one of the men fails to escape. Once your man is pushed down by one of the villains, you can press the red button and help him to spring away and continue his trip. Quick reactions are necessary to steer him among those who would detain him. There is a two-player option for this game. Any Time Left Over After Trip. $100 per unit of time left over. Okay folks, now that we have satisfied the Sports Freaks, the Pac-Maniacs, and the Sci-Fi-Blast-'Em-With-Your-Laser Fiends, we have something for the Junk-Food Junkies among you! According to the game instructions, the object of the game is to "Get Fatter! Consume as many calories as you can before you get your fill of purple pickles and the snack bar closes." This is accomplished by maneuvering Mr. Mouth (who looks like a set of purple dentures) to catch various forms of junk food which come hurtling toward him. While this may seem like the dieter's dream, scattered in among the pizzas, cheeseburgers, milkshakes, and french fries are purple pickles, which apparently cause gastric distress; if you swallow six purple pickles, the game ends. Each time a purple pickle is swallowed, it goes to the top of the screen to remind you how many you have consumed. After each 500 calories, one purple pickle is successfully digested and removed from the tally. The food comes in waves, with the speed at which it flies becoming progressively faster. At the end of each wave, a charming message flashes on the screen: You're Getting Fatter. Fortunately, each new wave does not begin automatically, but waits for you to press the red button on the joystick before starting to "serve" you once again. This gives you the opportunity to make a trip to the bathroom or the refrigerator without giving up the game. Since each type of food has a different calorie count, it is to your advantage to study the calorie chart and focus on the more fattening items. The first wave moves slowly enough to allow you to catch everything that comes your way, while avoiding the purple pickles. As the food flies faster, however, your strategy changes from offensive to defensive. Eventually, things are moving so quickly that it is all you can do to stay out of the way of the purple pickles. By doing so, you will also certainly swallow gobs of caloric food, thereby boosting your score. Since the food moves horizontally in rows, more or less, it is easier to position Mr. Mouth in the upper righthand corner of the screen. This gives him the most time to see what is coming and to move out of the way. Since he has an upper limit, it is less likely that he will overshoot his position and get hit by something coming above him. The drawback of this position is that sometimes he gets cornered there by purple pickles coming at him from the left, and blocking his way below. I found that this happened fairly infrequently, however, and that this position kept Mr. Mouth from becoming distracted by all the goodies elsewhere on the screen and subsequently becoming plastered with purple pickles. Since Fast Food is indeed a fantasy game, the calorie counts of the various foods are greatly reduced. Obviously, at these calorie counts, Mr. Mouth must consume a great deal of food before digesting one nasty purple pickle. 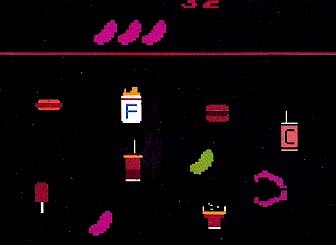 There is a two-player version in which players alternate turns after each wave of food. "Play continues until both players have burped out." The game instruction booklet for Fast Food gives us no clue as to who designed this game. After looking at it, however, I am convinced that the idea was conceived during a food fight in the high school lunchroom. I found the whole theme of the game rather revolting. (Blasting aliens is less offensive to me than swallowing whole milkshakes, glass and all.) If you can overlook this assault on your sensibilities, the game actually is entertaining, especially since its simplicity makes it less frustrating than some of the more complex games. I would have preferred the calorie counts of the food to be a little more realistic. Seeing thousands of calories mount up before my eyes might have cured me of junk food forever. 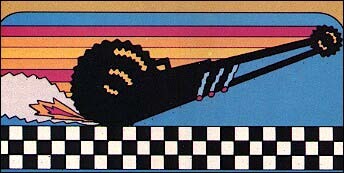 AN ATARI VCS GAME FROM PARKER BROS.
Spider-Man has his hands full these days, saving New York City from being blown to bits by the Super Bombs planted atop its skyscrapers. He must scale each building, capturing criminals and defusing time bombs on his way to the Super Bombs. Your joystick controls how and where he shoots his webs and the speed at which he moves up or down them. To shoot a web, you must press the red fire button on the controller and then move the stick in whichever direction you want to move Spider-Man. Releasing the fire button quickly results in a short web, while holding it down creates a longer one. Unfortunately, there is a limit to how long the webs can be. After the web is created, your joystick moves Spider-Man up or down on it. Webs can be shot straight or diagonally up and straight down the building. 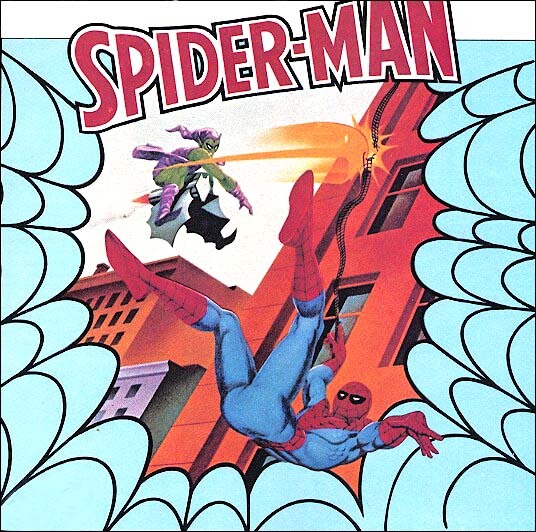 For Spider-Man to descend the building in a diagonal manner, he must first shoot a very short web up diagonally, and then lower himself, swinging freely. When he swings to the desired landing spot, you must quickly press and release the fire button to stop him. The end of a web must land on a solid part of the building; if it lands in the sky or on a window, Spider-Man will fall the moment you release the fire button. Spider-Man also falls if his web is cut by any one of the criminals or by the Green Goblin (the fiend who has placed all the bombs). The Green Goblin cannot be captured, and since he is also capable of making Spider-Man lose his hold on the building, must be avoided. The primary danger to Spider-Man is running out of web fluid. Apparently he has a little reserve of his marvelous liquid (in a hip flask? ), and each web drains a bit from his supply. Also, the fluid evaporates with time. Each time Spider-Man captures a criminal or defuses a time bomb, he acquires a little more fluid, enabling him to hang around the building longer. Once he runs out of fluid, he falls to the ground whether he is on a web or not. The amount of fluid remaining is shown in the lower corner of the screen. Fortunately, Spider-Man can shoot a web while in mid-air. If, for any reason other than lack of web fluid, he falls, you must quickly shoot another web to save him. 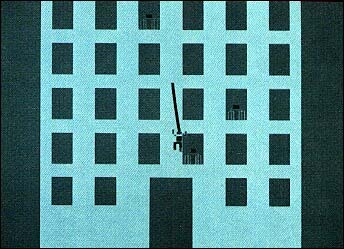 This is not too difficult, assuming he is high enough on the building to allow sufficient time for him to shoot and then catch himself. As Spider-Man scales the building, criminals pop in and out of the windows. His starting position is such that if you move him straight up he will be able to catch any villains showing themselves in the row of windows at his right hand. Don't waste too much time trying to catch the other guys--they are worth only 30 points apiece, and you do not earn much web fluid for catching them. Position Spider-Man so his web shoots up past the bomb to the next girder on the tower. The web must be very close to the bomb, so that Spider-Man's hand touches it as he climbs. Very often the bombs are lined up on one side of the tower, so that if he can position himself properly for the first one, he is in line for two or three more as well. Climb to the top of the high voltage tower immediately, just below the Green Goblin guarding the Super Bomb. Attach the web to the center of the girder on which the Goblin is running--just below, but not touching him. Move Spider-Man up the web and then to the next girder down. As he descends the tower, new time bombs will be ready for defusing and he can easily swing down his web and touch them with his feet. If he is in the center of the tower, he can move to the side on which the bombs are placed. They have very short fuses, so Spider-Man must move quickly to get his points and extra web fluid. After Spider-Man has defused the Super Bomb, a tricky tune plays and he starts again at the bottom of a new, more difficult building. On each successive building the web fluid is used up more quickly, so that eventually it seems that he runs out before getting started. Another complication is that once Spider-Man has acquired a predetermined number of points (different for each building and each game) the Green Goblin starts the timer on the Super Bomb. If Spider-Man is in the high voltage tower, he has a chance to reach the Super Bomb before it explodes. If he is lower than this, forget it; the bomb goes off after only a few seconds. This is another reason why defusing bombs is better than catching criminals; if the timer goes off, you can make the short climb to the top. The number of points allowed before the timer goes off on the first building usually seems to be between 300 and 420. The starting of the timer is indicated by an ominous, low-pitched sound. When you lose a Spider-Man, for whatever reason, the next one starts at the base of the same building. Before playing Spider-Man, I assumed that it was an easy game to play. It is simple, but not easy. More than almost any other game I have played, Spider-Man caused my hand to become cramped and blistered from trying too hard to get the little beast up the building. Improvement definitely came with practice as I became more familiar with the controlling movements; however, I still push the stick too hard in an effort to make him climb a little faster and hold on a little tighter. Perhaps the best thing about the game is that it comes in a real, honest-to-goodness, sturdy box. I was able to open it without tearing it to bits, and without the aid of a pocket knife. Thank you, Parker Brothers. You can see why it will take you a while to make 10,000. 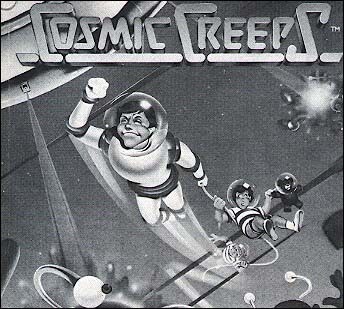 The Creeps in this game are not just weirdos with cooties, but beings actively plotting the demise of the Cosmic Kids. The planet on which the Kids live is in a disintegrating orbit and your mission is to rescue as many of them as you can before it falls out of orbit completely, killing the little dears. The Creeps also want to be rescued (who can blame them?) and are trying to make their way to your space station to assume command. When they succeed, it's curtains for you and the Kids. Before the Kids can be rescued, you must launch an Orbinaut from the planet and direct him up to the space station. The problems facing the Orbinaut are the floating red plasma and the Space Skeeters. If he collides with either of these, he goes flying off out of control, never to be seen again. Then you must release a new Orbinaut, which drops the planet one notch lower in its orbit, bringing it that much closer to doom. The planet will drop a total of 12 notches before falling completely out of orbit. 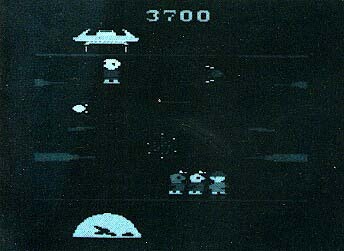 After the Orbinaut successfully makes his way to the space station, the first Kid appears from the lower left corner of the screen and begins zigzagging up to the station. Two Creeps follow so close behind that it is difficult to hit them with your "bopper" without also wasting the Kid. (Actually, he is only bopped back to the dying planet.) If the Kid makes it to the ship, you have an opportunity to launch another kid or to just bop the Creeps that are trying to reach you. To launch another Kid, press forward on the joystick; this also drops the planet another notch. After the first, the Kids not necessarily launched with the Creeps in hot pursuit. However, some of the Creeps move faster than the Kids and if they catch up to them, they bop them back to the planet. There can be no more than two Creeps and one Kid on the screen at any one time. To continue the game, you must amass 5000 points before the planet sinks from view. If you manage this, another planet appears and you start the whole routine over again at a faster pace. Scoring fewer than 5000 points results in instant termination. My scores were higher when I didn't try to save any more Kids than were automatically launched at the beginning of each wave. (Sorry, Kids!) The planet sinks a notch after a given period of time and I was able to score higher by bopping the Creeps than by saving the Kids, and thereby lowering the planet faster. This is particularly true if one of the Kids gets bopped by me or one other Creep. This is a very simple game without too many confusing intricacies. It is amusing, but depending upon your skill could get dull after a while. The first wave of Creeps seems to move slower and slower, and is, therefore, very boring. Since there is only one game and one difficulty level for Cosmic Creeps, you must plod through the easier stages of the game every time you play. You have seen Tron, haven't you? In this game you get to assist Tron in his fight to the death, directing him as he throws his trusty disc at his opponents. 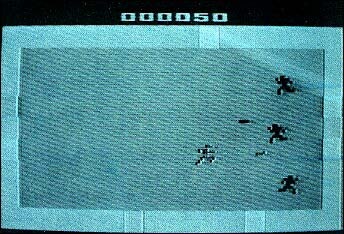 The bad news for Tron is that while the movie version of the game is one-on-one, the video version is three-on-one. Not only that, but they are replaced with new warriors every ten seconds. Launch a disc by depressing the red button on your joystick; its direction will be controlled by the position of the joystick. The disc can also be recalled by pressing the red button a second time. The disc is not harmful to your opponents after rebounding off a wall. If you destroy all of your opponents before the first one hit is replaced, you move on to the next scoring level. The warriors on each successive level are worth more points when hit, but are also more skillful in their attack. Each time Tron is hit, he weakens and fades in color. He may be hit a maximum of five times before becoming "de-rezzed"--Tron lingo for dead. Whenever you progress to the next scoring level, however, he becomes one step stronger and darker. Tron's opponents enter the arena through doors which Tron can lock open by striking them with his disc. This is most easily done during the pause between scoring levels. Once a door is locked open Tron can enter and be teleported across to the other side of the arena. This action hinders the opponents' shooting for about two seconds. It is, therefore, a good evasive tactic; use the two seconds to fire off a disc and eliminate one opponent. Lure the attackers close to you before being teleported; reappearing in the midst of a circle of enemies on the other side of the screen is not good for Tron. While it is easy to be trapped in the corners, try beginning each scoring level in a corner. This gives you the opportunity to fire directly horizontally or vertically to hit an opponent as he emerges from the door. Move away from the corner immediately after firing. Tron Deadly Discs has no game variations or two-player version. Good game. It's challenging but not impossible for the novice. Also, when playing Tron Deadly Discs, the more expert player can quickly move through the easier levels, avoiding the boring necessity of playing for ten minutes at a novice level before getting to the one minute of challenge as is the case for most video games. Now that Pac-Man has moved out, his domain has been turned into dungeons of the kingdom of Wor. In this maze, the Worling, Worluks and the Wizard of Wor are intent upon destroying your Worrior. Your defenses are your lasers and your radar scanner, as well as your own expertise in avoidance tactics. The Worriors are waiting to enter the dungeon from the lower right corner. You have 20 seconds in which to move the first man out into the maze at an opportune moment. If you wait too long, he will automatically be ejected into the fray--and perhaps into the waiting jaws of a Worling. These blue Worlings move around the dungeon at the beginning of each screen. There are six Burwors per dungeon, and they are visible as long as they remain alive. The Garwors are invisible most of the time, but do materialize for a few seconds at a time. They are yellow, but not at all cowardly. These are red when visible, and are faster and more dangerous than the other Worlings. During the first dungeon only the creatures mentioned above will bother you; however, in every successive frame the Worluk will appear after the last Worling is shot. If you succeed in shooting the Worluk, the point values for the Worlings shot in the next dungeon are doubled. The Worluk's main motive seems to be escape, but he can also destroy you if you get in his line of fire. The Wizard of Wor himself may enter the dungeon after the Worluk is shot or escapes. He is particularly hard to hit since he jumps randomly around the maze; you cannot anticipate where he will go next. You are awarded the title Worlord if you can kill the Wizard before he gets you with his lightning bolts. To assist you in keeping track of the invisible Worlings, you are equipped with a radar scanner at the bottom of the screen. The blips on this indicate the position of all the creatures in the dungeon, except your Worrior. Learn to use the scanner, as it is the only way to remain alive when the going gets rough. Your Worrior can fire only one bullet at a time (the bullet must hit a Worling or a wall before a new one can be fired). Try not to fire indiscriminately, since you may find that a bullet is not available when you really need it. There are times, however, when firing repeatedly is to your advantage. In the first screen there is a corridor which runs the entire length of the maze, along the top. If you position yourself in an upper corner of the screen and fire across the top of the maze, you can hit many Worlings. However, you must keep an eye on the scanner to be sure none approaches you from below. 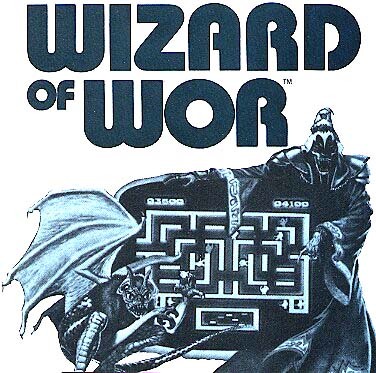 There is a two-player version of Wizard of Wor, in which players may either work together to destroy the Worlings, or fight against each other. Wizard of Wor is a challenging mazetype game which should hold your attention. The two-player version also adds versatility. Don't worry--it's not quite as scary as the package would indicate! Eggomania is similar to Activision's Kaboom! with a few new twists. In this game, a ridiculous looking turkey drops eggs on an equally ridiculous blue bear, who tries to catch the eggs in his hat. Since you are on the bear's team, you move him back and forth across the bottom of the screen by means of the paddle controller. 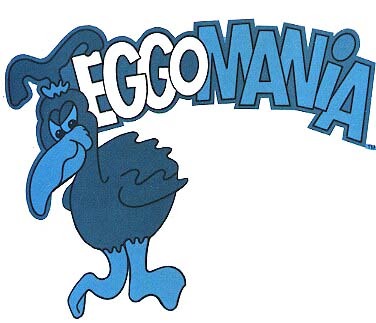 If you successfully catch an entire wave of eggs, you are given the chance to fire eggs back at the turkey while he does the "Eggomania Waltz." When the turkey is hit, he loses his lower feathers and twitters off until the next wave. If you miss an egg, the others fall to the ground, leaving a layer of egg yolk on the ground and the bear. The next time you fail to catch an egg, the yolk gets deeper until eventually the poor bear is covered and the game ends. Since the bear must catch the eggs only in his hat, and not just hit them with his body, he must be positioned under them as they fall. The difficulty in this is determining which egg is the lowest one at any given point; when the eggs are scattered across the screen with some distance between them, several may look the same distance from the ground. If you choose the wrong one to go after first, the other egg breaks immediately, and the wave ends with egg yolk all over the bear. The bear's hat is fairly wide, giving him some horizontal leeway in positioning, and making it possible to catch several eggs at a time with only slight movement. Try to move the bear as little as possible, rather than running all over the screen. Follow the pattern of the eggs, somewhat like a connect-the-dots picture. Your timing must be exact on this, catching the eggs before they fall below the rim of the hat. Since hitting the turkey with the collected eggs results not only in bonus points but also a reduction in the accumulation of egg yolk at the bottom of the screen, it is important that you have a fairly good aim. Unfortunately, hitting him is not as easy as it would seem; many times I was sure I had scored a direct hit, only to have him waltz on by. 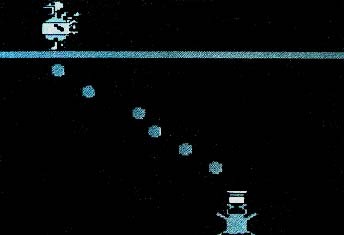 Do not try to follow him across the screen, but rather wait for him to approach you, firing just before he is directly over head. The speed at which the eggs are dropped increases with the successful completion of each wave. Therefore, you may find it to your advantage to miss an egg in the earlier, easier waves, so that you can get another chance to collect some points at a slower pace. You can do this several times, finally completing the wave and getting the chance to remove most of the egg yolk by hitting the turkey. The danger in this, of course, is that if you muff your chance you must continue to the next wave with no reduction in the amount of egg yolk on the ground. 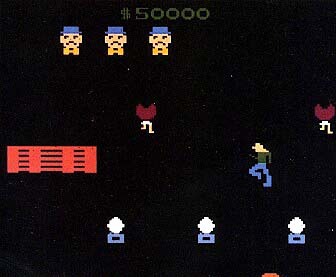 This cartridge includes one-, two-, three-, and four-player versions of Eggomania. This is a cute, but not spectacular game, with a catchy tune thrown in. Since many video games are simply variations on a theme, the extra effects are what make them fun. Eggomania gets good marks for making me smile. In case you did not realize it, Terra I is Earth's primary supplier of the Zenbar crystals, from which 72% of our energy is derived. Controlling Terra I and its planetary electro-mechanical equipment (including the robot-driven defense system) is a super sophisticated computer system--I am not certain if this system is manufactured by Atari. The computer system is malfunctioning and has turned over all Zenbar crystal shipments to space pirates, directing all its defenses to protect the pirates. Since we are quite a distance from Terra I (39,999 light years) you will need the F-711 Starwarrior to cover the distance and destroy the pirates and defense systems. On board the Starwarrior is a computerized (More computers! Fortunately these can be trusted, at least for the time being) navigational system which displays the distance remaining to Terra I, the number of shields left on your ship, and your score. At 39,999 light years from Terra I there are heavy meteor storms. The more benign of these move in a strictly vertical pattern, approaching from the bottom of the screen. When they are moving slowly, you can afford to be daring and move around the screen wiping each one out individually. However, when they start coming quickly, keeping your ship more or less stationary and clearing out those approaching from directly below you will result in more safety while still clearing the wave eventually. Once the meteors start moving in a diagonal direction they become much more dangerous. Watch out for the ones that approach from an angle and wipe out your ship. Move out of the way--fast! At 29,999 light years the space pirates arrive on the screen. They man slow cargo ships which fly a straight course and fire lasers. They are not hard to hit; simply fire and move out of the way before their lasers hit you. The bad news about the cargo ships is that they have fighter saucer escorts which move quickly and erratically, firing lasers. Mostly they crash into your ship; they don't really need the lasers. The best way to handle the situation is to start the wave at the top of the screen. Clear out as many meteors and cargo ships as you can while trying to hit or evade the saucers that appear. You must aim in front of the saucer, in its path; it moves so quickly that you will miss often before you learn the proper distance. As the saucer zigzags across the screen, it will eventually get quite close to you. At this point (assuming you have not hit it already) it is too late to try to destroy it; move down the screen. Do not try to get ahead of it or move horizontally out of its way. The patterns are such that it will effectively cover most of the screen above it. Don't worry, if any of the various dangers you encounter slip by you without being destroyed, they will be tacked on to the end of the wave. If you are hit at any point during the wave, you keep the points you have gained, but in addition to losing a shield (you start with five) you must go back to the beginning of that wave. 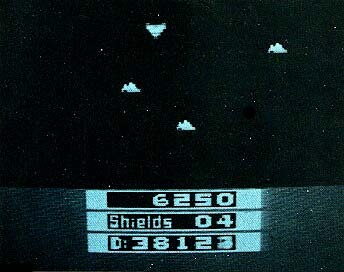 The numbers shown on your control panel indicating your distance from Terra I are automatically set back to indicate the beginning of the wave, and you will have made no progress toward your objective. At 19,999 light years the robot interceptors arrive. (By now the meteors and space pirates are all gone.) Your perspective changes, also, giving you a side view of your ship; before it was viewed from the top. You now fire horizontally. The robot interceptors come in two varieties, both difficult to hit because of their low profile. For the most part, their main threat to your ship is collision. Do not try to hit them as they come at you; slip down below them to move behind and fire at them from the rear. This way, if you miss, at least you can't be crashed. 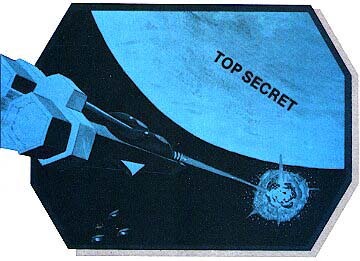 While all this is going on, there is another robot interceptor flying above your field of flight, dropping photon bombs on your ship. This fiend cannot be destroyed; simply avoid being hit by him. When you have destroyed all the other robot interceptors, this one will go away also. The final danger to your ship comes at 9999 light years in the form of fish force fields (yes, fish). These are horizontal bars which destroy your shield on contact. The only way to clear them out is to get close to the bar and fire at the "fish" which hangs down at one end. Each force field has its fish on the opposite end from the field which went before it. This means that you must fire and then immediately reverse the direction of your ship and fire again. Actually, rather than just hitting the fire button once, you are better off keeping it depressed throughout this whole episode. You can then concentrate on just getting your ship facing the right direction at the right time. As these force fields increase in the speed at which they descend on your ship, you may find it helpful to start the wave with your ship at the very top of the screen and gradually move it down as you are firing and changing directions. This is difficult, but otherwise you may get hit before you obliterate the field. Rescue Terra I is a challenging game, and if you do acquire a measure of expertise, you can enter Venturevision's Rescue Terra I Contest and possibly win a trip to beautiful downtown Dallas and $5000. Once you get to Terra I you are eligible to enter; the details are included in the game package. But hurry, contest ends December 31, 1983. The Mines of Minos are a series of underground mazes which, in times past, have been managed by a gang of robots. Now, however, the mines have been taken over by aliens who have dismembered all but one of the robots. Your remaining robot must frantically search the mine for pieces of his buddies while blowing up the aliens with time bombs. Complicating his not-so-peaceful life is the fact the mines are quickly filling with water, which slows him down and defuses his time bombs. Since the aliens have a history of violent behavior, your robot's primary objective must be to avoid them. The first monsters you will encounter move no more quickly than the robot and can be easily dispatched by dropping time bombs in their paths. Only one bomb at a time can be dropped, and each one can blow up just one alien. When two aliens are following closely, it is sometimes necessary to drop a second bomb immediately after the first has destroyed the closest alien. The bombs remain active for only a few seconds after you drop them. If you drop one inadvertently, stay close to it for a while until it stops buzzing and disappears. If you simply proceed on your journey, you might find yourself dangerously close to the aliens and unarmed until the bomb disappears or is exploded. You can step over your time bombs with no ill effects, which is handy when you are trying to position one between yourself and the oncoming alien. 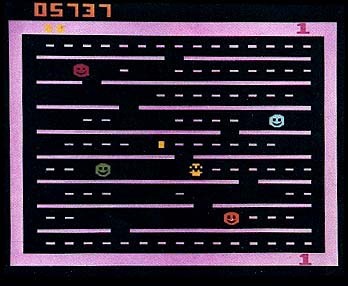 At the sides of the screen are several horizontal tunnels which enable your robot to make a quick getaway to the other side of the maze. If the red button on your joystick is depressed as you enter the tunnel you will find yourself in the next mine level. Once your robot locates a piece of one of his colleagues, he must then carry it to the center of the top or bottom of the mine level. He must collect three pieces in order to make a new robot; these are held in reserve in case number one gets destroyed by the aliens. 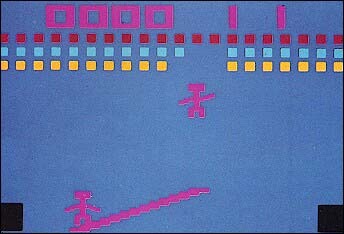 The first robot piece in the first level is located in the upper third of the maze, in the center of the screen. You should move there immediately, killing as few aliens as you can without endangering your robot. This will keep your score low so that you may be able to assemble one extra robot before the really mean monsters appear. (Their entrance is triggered by a high score.) Take the robot piece down to the bottom of the maze and leave it there. The next robot piece is also in the top portion of the maze, but it should not be under water yet. Quickly go up and retrieve it, this time leaving it at the top of the maze, under the water. You will have to clear the area of all monsters before you enter the flood, since you move slowly and are unarmed during the aquatic section of your journey. The next robot piece is in the lower section of the maze, and fairly easy to retrieve since it is not touched by the flood. This sequence of moves will assure that you will be under water only momentarily. If you drop the robot pieces at the wrong end of the maze, you may find your next piece more difficult to retrieve. At this point, you may want to go to the top of the maze again to try for another piece; however, it will probably be under water. This doe's not make it impossible to pick up, simply more dangerous. If you decide not to go for the underwater piece, your job is to kill as many aliens as you can to get your energy level up to 2. (This happens at 1000 points.) The aliens will be considerably more aggressive, and you will have to keep a constant watch to keep from being attacked. Do not move on to the next mine level until you have progressed to the second energy level. When the mine level exceeds your energy level, it takes more than one bomb to destroy an alien, a potentially fatal situation. Half-dead aliens are no longer dangerous once the sounds of the bomb explosion cease. 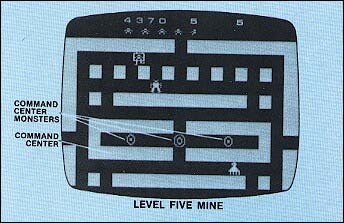 There are five levels in the mine, with the fifth one containing the Command Center for the aliens. You must destroy this Command Center by ramming its inhabitants with your robot (sacrificing the robot) to win the game. The basic game of Mines of Minos is surprisingly difficult. Your robot just fits through the maze, so you must be exact when directing him. The aliens are persistent, and just getting to the second level is a reasonable challenge. Starting with one of the less difficult games (5,7, or 9) is recommended. Usually, games that can be "won" have a limited appeal; once you master them there is no more challenge. However, this one will take you long enough to conquer that you will get your money's worth before it becomes too easy. Your power level is increased by one unit for each 1000 points. Game 2: Basic game for two players. Game 3: Six robot pieces needed to complete one spare robot. Game 4: Game 3 for two players. Game 6: Game 5 for two players. Game 7: Two pieces needed to complete one spare robot. Game 8: Game 7 for two players. Game 9: Bombs can be dropped in flood. Game 10: Game 9 for two players. Game 11: The maze is invisible. Bombs can be dropped in the flooded section of the maze. Game 12: Game 11 for two players. In Bermuda Triangle, your mini-sub is gliding over a seemingly deserted underwater city, collecting artifacts for the research ship cruising above. The artifacts are: Tachyon Modular Units, Water Dissociation Modules, and Korbinian Cubes. These all have tricky descriptions in the instruction booklet, but are identical in game characteristics and point value. You can carry only one artifact at a time. A nifty little sound indicates that you have a treasure in your possession. A different sound indicates that the research ship has accepted it. Hindering you in your quest for the artifacts are giant squid, man-eating sharks, and aquatic drones. These will all steal your artifacts from you if you collide with them. A collision also causes you to lose points. Additionally, explosive mines are sprinkled among the other aquatic villains, destroying your mini-sub on impact. These creatures and bombs can be blasted away, but will always be replaced by more. Since they can come from either side of the screen, try to stay more or less in the middle of the screen. By moving the joystick to the right, you can speed up your sub, a valuable move when maneuvering it through a herd of enemies. 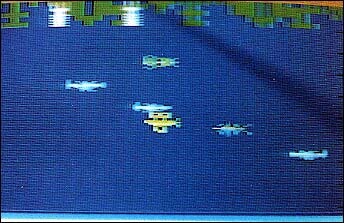 Research ships and enemy ships cruise on the surface, alternately, moving from left to right across the screen. If you mistakenly make contact with the enemy ship, your mini-sub will be destroyed. Bermuda Bombs sit on the ocean floor, exploding instantly if you try to pick them up. They look a lot like the treasures, so familiarize yourself with the picture's in the instruction booklet before you start to play the game. When you reach 10,000 points, you are awarded another mini-sub (maximum of three at any one time). At this point in the game a new problem presents itself. A deadly laser blast comes up from the city to destroy the ships on the surface. If you come in contact with the blast, it's all over for that sub. This is when the game gets difficult. When delivering the artifacts to the research ship, try not to remain still for more than a split second, but move away quickly. Try docking with the ship at the extreme right edge of the screen and then moving quickly backwards as soon as the treasure is accepted. This is by no means foolproof, but may increase the odds of escaping in your favor. The package insert telling the story of the Bermuda Triangle, and the game description booklet are very well done and imaginative. I was anticipating an equally mysterious and clever game, but was disappointed. The game is essentially a simple variation of the space game, but with complicated directions--certainly not a bad game, but not as good as I had hoped. Game 1: One player. Laser blast appears after 10,000 points. Game 2: Two players. Laser blast appears after 10,000 points. Game 3: One player. Laser blast is present from start of game. Game 4: Two players. Laser blast is present from start of game. 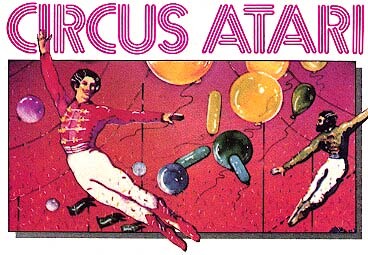 Circus Atari consists of two kamikaze clowns, a teeter-totter and three rows of balloons above them. The primary object of the game is to catch the airborne clown on the high end of the teeter-totter, thereby launching the other clown. Your secondary objective is to break the balloons with the bouncing clowns (apparently they have pointed heads) to score points. If the teeter-totter fails to catch the bouncing clown, he splatters on the ground, pathetically wiggling his broken body. While this seems fairly simple to accomplish, it is impossible to score more than a few points in the first three or four games. This is due not only to the difficulty of the game, but also to the fact that the players are often rendered helpless with laughter from watching the dying clowns. This game takes a fair amount of hand-eye coordination, and keeping a light touch on the paddle seems to enable the player to be a little more exact in his movements. Catching the clown on the uppermost tip of the teeter-totter results in a higher bounce and more broken balloons; however, it is also extremely easy to miss the poor fellow altogether. Apologizing to the splattered clown does not improve one's score. There is a total of eight variations to the basic game, as well as a higher difficulty level for each, which increases the speed of the clowns' rebound. Dragster is a realistic racecar game in which you can race against an opponent or just the clock. There are two variations of the game on the cartridge. Your first attempts at Dragster will undoubtedly result in utter frustration. You read the directions, plug in the joystick, get ready, set and Boom!--you just blew your engine. And you do it again the second time you try. And the third. And the fourth. Maybe by the fifth try you can get your car a few feet down the track before destroying it. The joystick in this game is a gear shift lever and the red button is the accelerator. The idea is to give the car some gas, let up a little, shift gears, and accelerate to the red line on the tach, where you let up a little and shift again. It takes coordination and a gentle touch. Completing the track in anything less than 6.20 is supposed to be good; your first time will be closer to 25 seconds as your dragster (which actually looks more like some sort of insect) crawls along, fearful of blowing its engine to smithereens. To achieve a decent time, you must accelerate well into the red area on the tach (which is displayed on the screen), let up for an instant, and shift rapidly (accomplished by moving the joystick to the left and releasing). Keep the tach in the red as much as possible without going too far for too long and blowing the engine. Lightly tapping the joystick to the left when in fourth gear "pops the clutch," resulting in a more rapid acceleration. Do it only twice when building speed in fourth gear; four times will blow the engine. Aside from getting the feel for how far into the red you can go before destroying your car, starting at the gun is the most significant factor in determining your final time. If you jump the gun, the screen reads "early" and your opponent has only to cross the finish line to win. I find that if I immediately gun the engine and shift when the count reaches 00:02, those 2/10ths of a second are taken up in my reaction time, getting me off the line at the earliest legal moment. Your reactions may be faster than mine, so experiment. 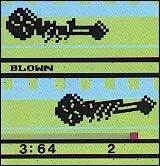 Once you master it, Dragster is a terrific game to pull out when demonstrating your superior ability to the Atari neophyte. He will never get across the finish line, and you need not share your secrets of success. Here is a change from the shoot-'em-up video games. Riddle Of The Sphinx actually uses more of your brain than your coordination (although working the two joysticks at once does demand some skill). This is one game in which you really must read the instruction booklet. In fact, settle down with a cup of coffee . . . it's going to take you a while. The riddle involved here actually has little do with the Sphinx, but more with the Egyptian gods, Ra, Isis, Anubis, and the Phoenix. You are directing the Pharaoh's son, Prince, (tricky name) through the desert as he collects treasures and offers them to the various deities. Along the way he meets thieves and nomads, camels and scorpions, as well as Anubis and Isis. The nomad traders are sometimes good and sometimes bad, depending mostly on what Prince is carrying. If he is carrying little, bartering with them will result in an addition to his collection. On the other hand, they will relieve him of some of his booty if he is too heavily weighted. With this in mind, use caution when approaching these traders. Camels do not get involved at all with Prince, except to force him to make detours around them as he covers ground. The god Isis, the goddess of fertility and motherhood, is good news in the desert, healing Prince of his wounds and quenching his thirst. Sometimes she also gives him a gift, as well (No, not a baby!). She will, on occasion, ignore him but will never do him harm. Anubis, the god of the land of the dead, is bad news. He seriously wounds Prince on contact, and cannot be killed with rocks. In fact, hurling rocks at him (or at Isis) results in a significant loss of "inner strength points." More about that later. Shield. This protects Prince from a few of the rocks. After a few hits it will disappear. Staff. Not as in assistants, but as in walking stick. This has undefined powers and is hard to locate. Hold onto it once you find it. Jug. This is full of some marvelous liquid which quenches Prince's thirst. He may carry it for a long ways (until someone steals it), but may drink from it only once before it disappears. Tannis Leaf. This useful little herb will heal all of Prince's wounds at any one time. It also disappears after it is used once. Spade. Use this shovel to dig for other treasures. It disappears only after another object or treasure is found. 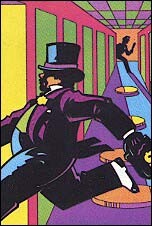 Even though all of the above objects may be used only once, Prince may reacquire any of them later on in the adventure, perhaps in a different manner. Disk of Ra which will heal all of Prince's wounds without deteriorating or being consumed. Goblet, which will quench Prince's thirst for as long as he keeps it. Necklace, which will protect Prince from rocks and scorpions for as long as he keeps it. Scepter, which will speed Prince on his way; wounds and thirst cannot slow him down while he holds this. All of the above treasures can be kept until stolen. They are obviously very valuable to Prince, so he must protect them. Artifacts and other mysterious treasures found along the way include a scroll, a crown, an ankh, a key, and three stone tablets. These artifacts and treasures have value, but we are not told in the instruction booklet exactly what it is. Any items which Prince has in his possession are shown at the bottom of the screen. 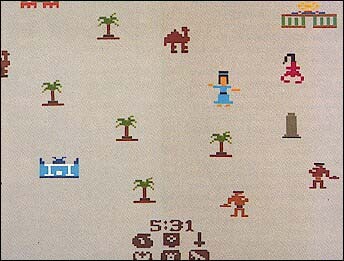 At first it is very difficult to identify the particular group of dots illustrating an item; this is one of the limitations inherent in the video game. After you have played for a while, you will no longer have to refer to the instruction booklet to determine if that thing you just picked up is the shield or the Disk of Ra. Only twelve items at a time may be carried by Prince. He may want to drop some of the less valuable ones to make room for the treasures as the game progresses. All objects, treasures, and artifacts are controlled by the right joystick. Prince can hold only one object at a time, and that particular item is indicated by a black box covering it. You must press the red button to employ some of the items; others are put to use simply when Prince holds them. Along the way, Prince encounters various monuments and temples. Each of these has a cryptic message inscribed on it, subtly indicating what the appropriate offering is. If Prince makes the proper offering, it is consumed and perhaps replaced by a more valuable item. If he offers the wrong item, he loses inner strength points. The monuments include the Pyramids, the Phoenix, the Temple of Isis, the Temple of Anubis, the Sphinx, and the Temple of Ra. At the final monument, the Temple of Ra, if the treasures are accepted, great numbers of inner strength points are awarded and the quest is ended. Actually, it's not quite that simple (simple?). Along the way, thirst will slow Prince down, as will wounds. The latter will eventually result in Prince's death, ending the quest prematurely. Prince must be constantly aware of his wound and thirst scores, displayed on the screen with the proper combination of Black/White Color lever and right difficulty switch positions. Also displayed with the proper combinations of these switches are the time elapsed and the inner strength score. Okay, now about this inner strength stuff: One of the Prince's objectives is to gain as many of these points as possible by making the proper offerings and hitting scorpions and thieves with rocks. His inner strength score suffers if he clobbers one of the helpless nomad traders with a rock (even if the creep does take one of his treasures), or if he offers the wrong item at a monument. He loses inner strength if he touches Anubis, or if he hits him or Isis with a rock (stoning a lady is definitely not good for one's inner strength score). Game 1: Prince makes the journey through his kingdom as quickly as possible holding as many treasures as he can find. Ra accepts the treasures without requiring an offering. Prince begins the trip with the shield. 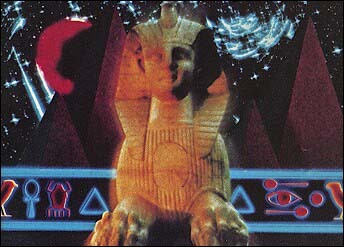 Game 2: When Prince gets to the Sphinx, it will not let him pass unless he makes the proper offering. At the Temple of Ra, no treasures will be accepted without the proper offering. Prince starts out with a shield. Game 3: Two offerings are required at the Phoenix, the Temple of Isis, and the Temple of Anubis. A treasure is to satisfy the gods, and another object is to break the spell and let Prince pass. More clues about this are in the instruction booklet. The Sphinx still requires only one offering to let Prince pass. An offering is necessary for Ra to accept the treasures. Prince begins his trip with the spade. While there are riddles and clues involved in this game, the solution of them does not immediately end the challenge. There is still much room for improvement in terms of inner strength points and time required to complete the journey. After you have played all three games, you can continue to improve your score with practice. Riddle Of The Sphinx is an enjoyable way to spend quite a few hours. And in case you want to get started early on the solution, Pharaoh's Astrologer has written: "Ra has all. What need has Ra of wealth? Offer instead that which stands yet cannot stand; that which journeys far yet has no legs; that companion you rely and lean upon, yet never think to call a friend." Good luck! Once you reach the Temple of Ra, if you are not ready to make your offering, you must go back; there is an upper boundary beyond which Prince cannot go. When he is going back over previous covered territory, keep Prince to the extreme left or right of the screen to avoid being hit by thieves or other baddies without warning. All the cute little sayings and inscriptions will give clues as to which offering to present where. these are not difficult to figure out, but you may have to think--just a little. Clear out any hazards around the monuments before making the offering; otherwise you may get distracted and the offering will not be accepted. After making an acceptable offering, do not hang around under the monument. You will lose inner strength points.